It’s mid-January and many of us probably wish we could still be out enjoying the sun rather than sitting in an office (for those of us who work in offices). With people back at work, also back is Auckland’s traffic, not that it effects me as I breeze past it on the Northern Busway enjoying the view from the top of a double decker. And the traffic is only going to get worse as more people return from leave and in a few weeks schools and then universities return. The period from mid-February through to mid-April, when school holidays start again, is the busiest time for transport in Auckland. The roads are busy, public transport is busy and our cycleways are busy. While there is still a lot to do to build out the quality and capacity needed on our public transport and active mode networks, and many of the projects already or about to get underway will be transformational, experiences here and overseas show our roads will still be congested and it is not possible to build out way out of it with more roads. We also know that if we want our roads to be freed up we only really have two options. We follow the path of Detroit and have a failing economy. We introduce a form of road pricing. On that second option, this recent video is great at explaining why road pricing works. If we compare Auckland against these building blocks we can see we have all four in progress. 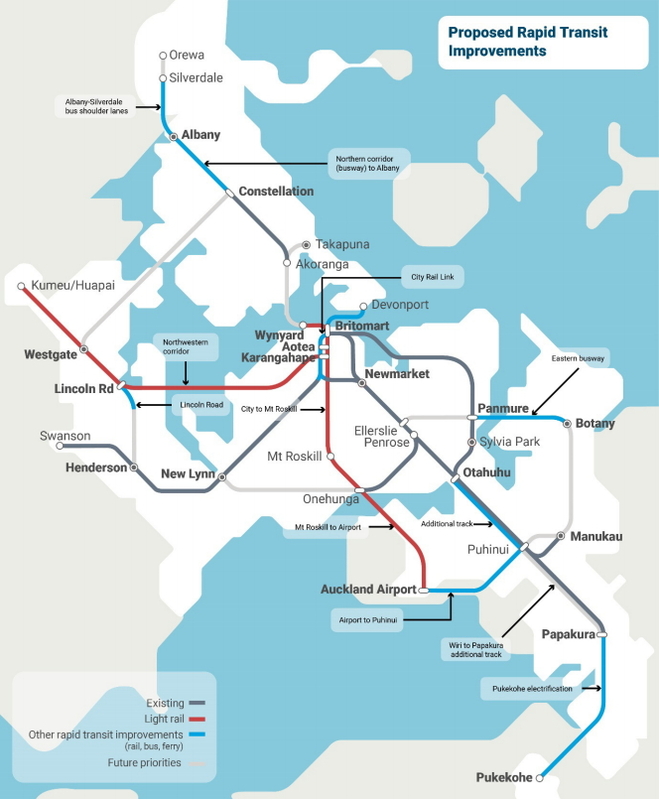 Auckland has dramatically improved its public transport over the last 15 years and the next 10 will see a lot more improvement, especially in the attractiveness stakes with a number of rapid transit projects planned, many of which will be well underway or completed within the next 3-4 years. 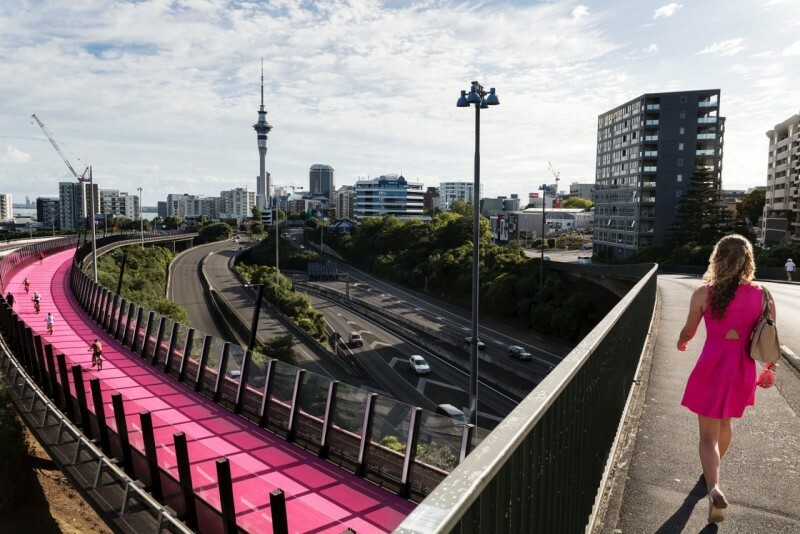 Auckland has been improving it’s cycling network over the last few years, including cycleways that have put us on the map like Lightpath. The coming decade will a lot more of money spent on cycling, although not as much as we’d like. Still, we should see some good quality cycleways built and based on the recent projects, we’ll see very strong uptake. 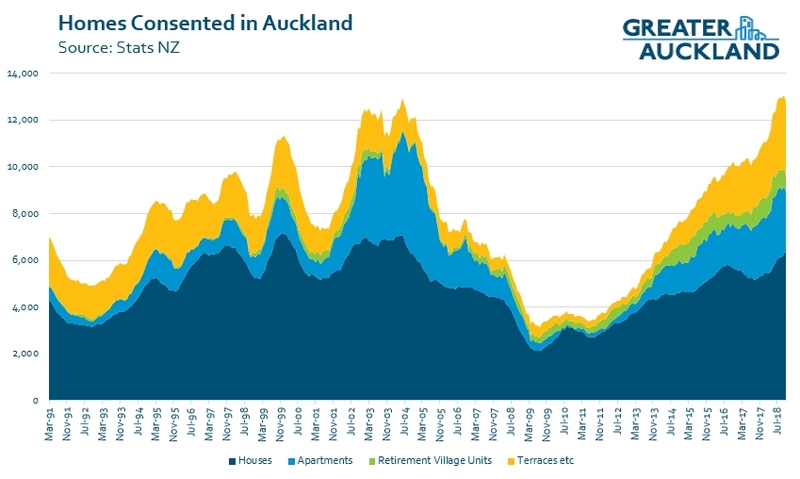 The Unitary Plan has helped unlock housing in many areas and the results are already being seen with construction booming across the city and over half of all new consents being for attached homes. Late last year the council unanimously voted to trial closures of some roads in the city centre and for a plan called Access for Everyone which will see city streets prioritised for pedestrians, bikes and buses with the aim of reducing the number of cars in the city. Road pricing is something currently being looked at by the Ministry of Transport and other agencies under the name of The Congestion Question. We expect to hear more this year about what the preferred solution would be for implementing such a scheme and how long it will take to implement it properly. The regional fuel tax that was introduced last year is also intended to only be temporary until an actual road pricing scheme can be implemented. If Auckland does manage to keep developing in the direction it’s heading, we might even see a city in which people stop complaining about the traffic, wouldn’t that be a novel outcome. Within a radius of about 3 or 4 km from Otahuhu there are about 8 or more apartment projects completed or near completion. One is large with about 600 residents. Benefits here include being close to PT and popular Sylvia Park. They are smart and have good outlook. I have been inside 2 of them. They give a big lift to the area which has been looking very run down, At least one has communal waste separation and collection. So with about 1000 extra people in this suburb there has been a saving of about 5 sq km development of farmland at Pokeno where it is mean to have any young family living far away from the city and expensive, very time consuming, unfriendly living. Yes good comparison with Pokeno. Pokeno is within the Waikato Regional Council boundaries and has nothing to do with Auckland Council or Auckland Transport. The Otahuhu manson apartments is great, especially close to the new Recreation center. The only issue that sets Otahuhu back is demographics need to have higher average incomes to improve local spending to improve the shops. To really fix it they need to attract affluent young residences. However the local decile 1 state school has a poor perceived quality due to gangs issues that scares away the affluent people. It just needs a catalyst such as improvement in train frequency and speed, a more affluent workforce, and improvement to local schooling. Or an alternative approach until something like improved wages comes their way. Because that might never happen. Community-building initiatives can be powerful. I was actually looking at those apartments. Very nice location. Couldn’t afford it. Pity about all those poor brown people. Wish, they’d go move somewhere else so the richer whiter folk can come and “improve” the area. Interesting stuff about avoiding gentrification in the Superblocks concept in Barcelona, Ari. Probably worth getting it blogged about sometime. The point was that the superblocks made the place far more liveable and pleasant. Yet it was public housing, and they knew ahead of time to ensure it would remain public housing. We do need to think these things through. Everyone deserves to live in a nice environment, and we shouldn’t avoid building nice environments just to avoid gentrification. But we do need to ensure everyone has access to it. That video is really worth watching. Thanks for the link. Reading a report written soon after they started the trial, what strikes me is that they expected a main, unpriced road nearby to see raised traffic levels, but it didn’t. And bottlenecks in areas well outside the priced area were eased as well. The network effects seem huge. Reducing traffic on some roads like this reduces traffic on the network. Just as NZTA inducing traffic on our motorways with their continuing widening projects, is increasing traffic through all our local roads. We sure know how to waste money by having different projects work against each other. We have our very own example of this effect right here in Aucklands CBD – Albert St. Despite predictions of utter meltdowns, the “carmageddon” predicted has not arrived. The madness here is not that the traffic planners simply don’t know much at all about what they claim is a “science”. And secondly that AT is currently hellbent on restoring it back to its former glory by encouraging traffic back there now the CRL enabling works and cut and cover tunnels are nearly done. Yes a lot of these works are probably reducing congestion in the wider area also. So we have a choice between either road pricing or congestion. But why assume that people would prefer road pricing? Maybe the majority of people would prefer congestion. Comparing it to say broadband, I’m sure more people prefer an unlimited fixed price data plan that slows down at peak times than a variable priced pay as you go always fast plan (but businesses tend to need the latter). Would they still want this if in choosing the latter instead, they can help fund some improvements and alternatives? Fuel tax can cover costs imposed on the environment and society of using that fuel. Congestion charging can cover costs imposed on society by having to build infrastructure to cope with the peak volumes. Carpark taxes can cover costs imposed through poor land use and through the traffic the parks induce. All three can cover costs due to the physical inactivity and poor social outcomes the mode causes. A combination of all three pricing measures is desirable. Wouldn’t you say, Jimbo? Otherwise people living in the central city using an at-grade carpark for a car they barely use won’t be contributing to that poor land use and extra distances people have to travel. And people using electric vehicles won’t have to contribute to the cost of the infrastructure and public health impacts through crash injury. Etc. I would say the purpose of congestion charging is so they don’t have to build infrastructure to cope with the peak volumes. I’m just saying an alternative to that is to not build infrastructure and make the congestion itself be the demand management mechanism. I have no problem with congestion charging in the city centre (in my opinion there shouldn’t be any cars there anyway). But if there was a charge to use the southern motorway for example, I think that will really affect poor people to the benefit of richer people. It probably makes sense economically (the rich people’s time is probably more important to the economy), but I’m not sure it would be that great for society. The poor to rich scenario doesn’t really play out if you look at demographics. The wealthy are much more likely to drive compared to poor people and this is especially the case during the peak because people with low incomes tend to be working the types of jobs that don’t coincide with your regular 9-5 (part-time service industry or late nights, etc). It’s also important to understand that each person’s internal value of time (not the average used in planning) varies drastically depending on what they’re doing. One of the interesting outcomes of some of the HOT lane trials is that paying users cross the spectrum: BMWs in the congested free lanes and beat up Chevys in the paid lanes. This is because the BMW might not be willing to pay $15 to get home from work a few minutes sooner, but a low-income worker will be really happy to pay $15 so they aren’t charged $50 for picking their child up late from daycare, or so they get to work on time and aren’t fired. Without the paid option they’d be up a creek. It’s also important to understand that these sorts of schemes usually include additional funding for PT, which benefits the lowest-income population the most. I’d expect that an Auckland charging scheme would be a cordon around the CBD and possibly inner suburbs. This would actually benefit people further south on the Southern because it would reduce network traffic. Preferentially, there may be a question, but economically, there’s no question. Putting a price on something sifts out the low value uses and makes the resource more available for quantifiable productive use. Any business with a time/transport cost component should be strongly in favour of road pricing. Businesses that can deduct costs and just increase prices, sure. Salary and wage earners? Not so much. It will be key to see how much fuel taxes reduce once congestion pricing is brought in, if at all. Yeah, but Broadband congestion isn’t going to kill the planet in 50 years. That is probably better fixed through fuel tax. Agree. Don’t create more capacity but do increase fuel tax. Perhaps even limit capacity further by pulling a leaf out of the Ghent playbook and prohibit access of traffic around schools at key times in the school day that could allow more kids to get there independently on foot or bike. Right through that intersection the separated bike path begins but she’d already been made extremely nervous by a bus that was half across the non-separated part of the bike lane on Triangle road. Which got me to thinking how someone like that would pretty much never consider riding to work if it weren’t for the separated bike path. I’ve noticed a lot more congestion on Customs St and Beach Rd this week than there was last year, must be people who used to use Quay St. Will be interesting to see if it dies down as they realise driving through the CBD is not going to be as easy as it used to be. From my memory of Customs Street and Beach Road from 2015 it wouldn’t be possible for them to be more congested this year. There was almost always stationary traffic the entire length of the road. I could frequently walk from the bottom of Symonds Street to Wynyard Quarter faster than my bus. Sorry fuller is anti competitive monopoly with poor social responsibility. They will not improve service without some incentives or external pressure. I wonder where the political enthusiasm to put in place congestion charging is going to come from? When the Auckland petrol tax was introduced it seemed to represent the end of the world for many and the media fed on the furore. I suspect that at least in the short term change will come from making other options more easy as you suggest. With pressure on the authorities it may be that they allow driving to become harder. For example, more of the budgets that are currently spent on roads could be diverted to public transport, walking and cycling. Or using bollards to turn residential areas into mazes for cars. It would be very quiet and safe to cycle and play in these places. I don’t agree with the hierarchy of reasoning in this article. “Road-pricing is the solution and everything else just makes it easier to introduce and make it practical.” Everything in the list here is important to reducing congestion, and they too all help each other in many ways. It’s a complicated web. I think removing the most above quote in the comment will turn the focus on road price into a component of the web, and change the tone of your article into being an explanation of that component. Also, isn’t this actually about making the city more accessible, healthier, more enjoyable to travel, and more pleasant to look at? Shouldn’t GA go more into that when talking about reducing congestion, and that congestion is only one part of the pie? I disagree. Every time one person switches from driving to bussing/training/biking/walking there is enough suppressed demand that another driver appears to fill their place. The first 3 approaches give people alternatives to avoid the congestion if they wish, but they’ll never make the congestion disappear. Economics dictates that as long as road space is under-priced it will always be over-subscribed. “Make it easy to cycle and walk” – lots about cycling, but what’s happening about making walking easier? Walking is the primary essential for any liveable central city, ahead of any other mode. Agree, Mike. And while some may see the Lime Scooter phenomenon as a retrograde step for walking, I see it as an opportunity to get people thinking about walking safety. That our authorities and politicians have turned a blind eye to the dangers the car and the poor built environment has provided for people walking is something that must stop. Pity that it took resistance to something that is far better for the environment and for physical activity levels than driving is to get some focus on walking, when the biggest dangers to people walking remain unchallenged. Thanks for sharing our video! De-congest New Zealand! That’s one hell of a stretch comparing Auckland to Detroit. We don’t have any major industry or socioeconomic group about to abandon the inner city for the suburbs.